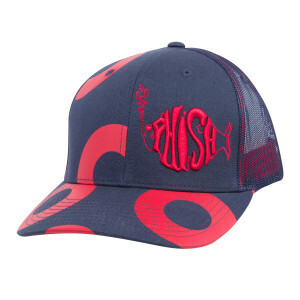 Premium Snapback hat featuring a 3-D (puffy) Phish logo embroidered on the front right panel and Fishman's donut dress pattern on the rest, with a full mesh back for easy breeze. Nice quietly...with fast shipping.nice bright colors, good way to represent jon Fishma when out on tour or at shows.... hopefully they will come out with more Fishman goodies.... but over all great product, well done phish dry goods keep it up?? Love this hat, its great quality!! Shipping was fast. Of all the new items in the Dry Goods catalog, this hat is tops. Love the construction of it, and stands out enough that all my friends can find me at shows. My Fishman wardrobe has a new addition with this awesome hat!! This hat is great! Well made; fits well and I look quite handsome in it :) Please, bring back the trucker hat, too, I need a new one! A great fitting hat with a sturdy design. The embroidery of the Phish logo is good quality and the donut circles do appear like they will peel or flake away. Some hats are mis-formed and have a point at the top. This hat is perfectly shaped and very comfortable. The price is standard for the Dry Goods website, a little too high but I cannot complain about the quality of this product. Very glad I bought it and may go back to buy the black/subdued logo hat next.